A seven-member bench of Supreme Court of Pakistan on Thursday convicted Prime Minister Yousuf Raza Gilani in contempt of court proceedings against him for refusing to comply with an order to write a letter to the authorities in Switzerland asking them to re-open corruption cases against President Asif Ali Zardari. The ruling said that Gilani was guilty of contempt, but would serve a sentence only “until the rising of the court,” or by the time the judges left the chamber. That happened about three minutes after the verdict was handed down. “For reasons to be recorded later Prime Minister and chief executive Yousuf Raza Gilani is found guilty and convicted for contempt of court,” Justice Nasir-ul-Mulk, the head of the seven-judge Supreme Court bench, said. Counsel for Premier Aitzaz Ahsan said he would appeal the verdict, further delaying any action that could see Gilani lose his job. According to the order issued by the Supreme Court, Prime Minister Gilani was found guilty and convicted for contempt of court under Article 204(2) of the constitution read with section 3 of the Contempt of Court Ordinance for willful flouting, disregard and disobedience of this Court’s direction. The court’s order further stated that as regards the sentence to be passed against the convict we note that the findings and the conviction for contempt of court recorded above are likely to entail some serious consequences in terms of Article 63(1)(G) of the constitution which may be treated as mitigating factors towards the sentence passed against him. He is, therefore punished under section 5 of the Contempt of Court Ordinance with imprisonment till the rising of the Court today. 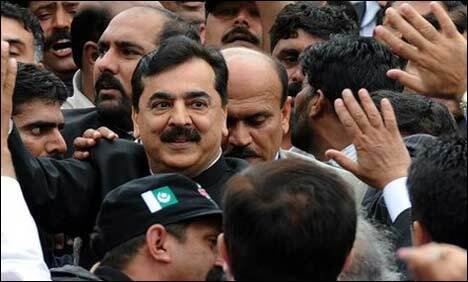 Prime Minister Gilani stood before the SC to hear the verdict in contempt case for not implementing the apex court’s ruling on the National Reconciliation Ordinance (NRO) and smiled when the verdict was read out in a packed court house. Under Pakistan’s constitution anyone convicted of defaming or ridiculing the judiciary is barred from being an MP, but legal experts say the process to disqualify Gilani could be a lengthy one, involving the parliamentary speaker and the Election Commission. Gilani is the longest-serving prime minister in the history of Pakistan, where civilian governments have repeatedly been toppled by the country’s powerful military, often with the support of the Supreme Court, which critics allege is heavily politicized. Corruption charges have routinely been used to target those in power, or seeking to return. It is pertinent to note here that the court issued contempt notice to the premier in February for refusing to write to the Swiss authorities to re-open graft cases against President Asif Ali Zardari The prime minister has appeared twice before in court and has maintained his innocence throughout, saying he had done nothing against the rules of business. Aitzaz, meanwhile, had argued that the bench was not eligible to hear the case as it had taken the notice itself. It should be mentioned here that it was the first time in the history of Pakistan that a prime minister appeared before the court and was convicted of contempt.